In natural healing, the reason why you get any type of disease is you either have toxicities of some sort or deficiencies of nutrients. In the case of overactive bladder, the toxicities could be chemical triggers and the deficiencies could be of a number of vitamins and minerals. You can address these both by eating more healthy salads during the day. Salads contain fruits that help the body detoxify and vegetables that rebuild and nourish the body. Vegetables also contain chlorophyll, which is a great aide in the detoxification of the body as well. There’s not just one type of salad you should be eating; in fact, adding a simple lettuce and tomato salad daily is just not good enough when there are dozens of other fruits and vegetables available. These other fruits and vegetables provide plenty of medicinal constituents as well as vitamins and minerals such as hundreds of different types of carotenoids, anthocyanidins, bioflavonoids, hormonal precursors, antioxidants, and many other phytonutrients. The solution is eating salads with multiple ingredients. Now before you start worrying about the time factor, remember that you can always do things smart in the kitchen and prepare a large batch of salad that will last you three days. That means you are only taking the time in the kitchen to make salad twice in a week. Can you handle that? Is your health worth it? 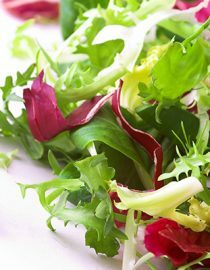 In a large salad bowl, mix the Romaine lettuce, baby spinach leaves, arugula/salad mix, cucumber, sugar snap peas and celery. Toss. Next add the mushrooms, fennel, onion and lentils. Toss again. Finally add the blueberries and strawberries. Toss lightly and serve. This recipe will provide 20 servings fruits and vegetables. No doubt, you can’t eat it all in one sitting at a meal! But why not divide it into two or three meals so you can have it on Monday, Tuesday and Wednesday? You can vary the salad a bit by the type of protein you add to it. On Monday you could add a chicken breast to it with your own salad dressing, such as honey mustard. On Tuesday, you could add steak meat to the salad with a ranch-style dressing. On Wednesday, you could add eggs and cheese to the salad with a vinaigrette dressing. Each day you are getting six servings of fruits and vegetables you never would have had before – and that’s a plus for your health. See what two salads a day will do for your health. Give it the old high school try for 30 days. You may just uncover a brand new you. While you may not be able to cure OAB, you can certainly control your symptoms and reduce holiday stress with some smart choices and a good backup plan.